By far the most cost effective means to meet your market and network one person at a time to improve your business performance! Le Salon National du Mariage is the latest major bridal show showcasing both national and local wedding and celebratory event products and services to thousands of brides and grooms, families, friends, wedding planners and anyone planning a celebration in need of your product or service. Exhibiting at Le Salon National du Mariage provides a unique opportunity to increase your exposure in the wedding market and to reach thousands of potential new customers. Connect with potential customers and other wedding professionals to increase sales, obtain referrals, introduce new products or services to the market, educate the market, create partnerships and exchange ideas. Engaged couples will find everything they need from high end luxe to moderate products and services from industry retailers and manufacturers held this year with Les Grands Salons Marions-Nous at the Place Bonaventure Montreal, a state of the art convention centre. Le Salon National du Mariage provides a wedding marketplace where you can make appointments with thousands of potential customers or sell your product or service directly on the premises. Increase your company’s sales and obtain high quality leads with direct face-to-face contact at Le Salon National du Mariage, a two day bridal exhibition held in Montreal. Record breaking, high profile marketing plan targeting people that have a need for your product or service with media advertising, direct mail campaigns, targeted html blasts and social media interaction. Newest major professional Montreal bridal show to be held on a large scale with the major names in the bridal industry and held this year in conjunction with Les Grands Salons Marions-Nous at Place Bonaventure Montreal, a sophisticated, world-class convention centre. Your company name and link to your company website will be listed on the Le Salon National du Mariage website for a 12 month period after the wedding show for additional visibility in the wedding market. Tailor-made sponsorship opportunities are available accessing incomparable market visibility to promote your brand, product or service to a 4 billion dollar a year industry with couples shopping for their wedding, honeymoon and newly married lifestyle. 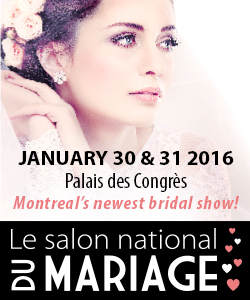 Download a Le Salon National du Mariage banner to your website or in your social media interactions. Select one of the sizes below and right click the image to “save image as” or “share this image” or “email image” to promote your participation. Engaging Facebook and social media interaction with a slick, modern website.